But we're not talking traditional boat building here. 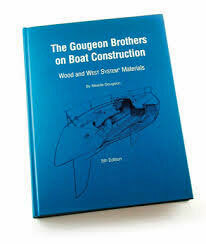 There'll be no mention of 'larch on oak', and clinker or carvel built won't get a look in. 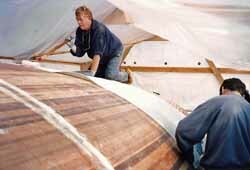 This is all about building a cedar strip hulled boat using epoxy and woven glass rovings. 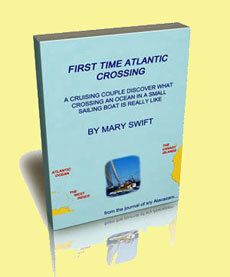 Alacazam she'll be called; that's her creaming along towards Antigua at the top of this page. 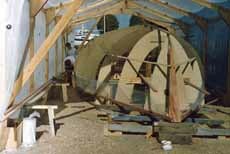 Having completed the 1" (25mm) thick cedar strip-planked hull, we were ready to prepare for sheathing it in epoxied woven glass rovings. The first stage of which is to sand it smooth with light, sweeping strokes of a rotary sander - a very dusty process involving a facemask and a prolonged shower afterwards. The bi-axial rovings come in 4' (1.22m) wide rolls, so there'll have to be some provision for the additional thickness where they overlap. 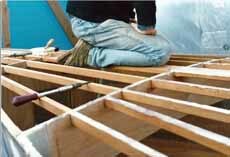 Once the sanding process was complete, we marked these positions on the hull and ground them out a little with the sander to accommodate the additional thickness of the overlap. 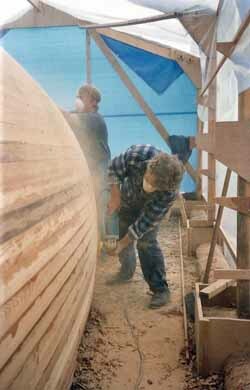 another applies the resin to the hull, lays the rovings upon it (much like wall papering) and rolls it with a metal washer roller until all the air pockets are gone and the rovings are fully wetted out. 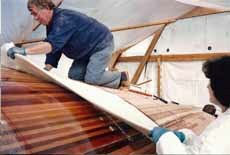 This process was carried out one hull side at a time, and once the epoxy had fully cured the overlapped join along the centreline was further reinforced by another layer of the woven glass bi-axial rovings. 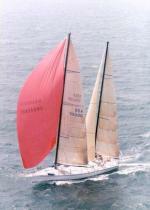 We now had a hull that was impervious to both water and the most persistent of gribble worms and other marine borers. 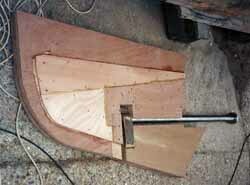 Hulls built using this cedar strip boat building technique require very little fairing - much less so than would a steel or ferro-concrete hull, but they do require some. The fairing compound is once again an epoxy product; this time the usual two-part product of resin and hardener, plus a micro-balloon low-density filler. 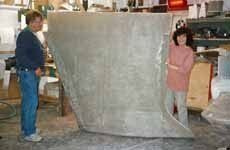 Before this is applied the entire hull must be abraded to remove any shininess and provide a sound base for the epoxy fairing compound to key into the epoxy glass surface. 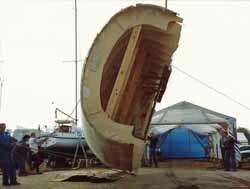 Fairing is done with long sandpaper-covered flexible plywood boards, swept diagonally over the hull to avoid creating flat spots until passing the critical eyeball test. Finally the hull is braced internally, removed from the shed, turned over with a crane (a hair-raising, buttock-clenching process that I didn't enjoy at all), and reinserted into the shed the right way up. 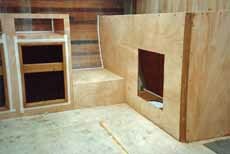 Now we could start the next stage of this cedar strip boat building project; glassing the interior surface of the hull and installing the bulkheads.